Dubbed Kenshiro by his makers at Japan’s University of Tokyo, this kid-sized robot is the latest in cutting edge musculoskeletal machines. 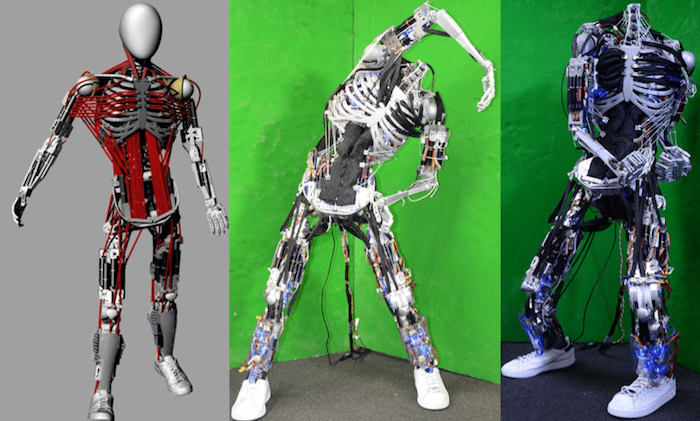 The robot has 160 muscles artificial muscles, allowing for 64 degrees of freedom or axes of rotations excluding the arms, and was designed to mimic a 12-year-old Japanese male, standing 5 feet and 2 inches and weighing 110 pounds. Based on its predecessors Kojiro and Kenzoh, the Kenshiro bot is quite stunning in its human-like features, being capable producing nearly the same amount of torque as human joints. Even aesthetically, with its aluminium bones and pulley-like “muscles” that mirror perfectly the human body – minus the head. The robot has more muscles than any other bio-inspired humanoid out there – 22 in its neck, 12 in its shoulders, 76 in its abdomen, and 50 in its legs. The artificial muscles are comprised of a system of pulleys, however instead of single point-to-point muscles, they decided to make planar muscles. Check the abs to understand better. The whole point behind the Kenshiro robot isn’t to make it stronger, smarter or faster than the human body, but mimic it and it turns out it’s quite the challenge. Getting the right weight is a tricky issue in particular, and they tackled it by designing as natural as possible. For example, a 55 kg boy would have about a 5 kg thigh and 2.5 kg calf. Much in the same way, the engineers developed each individual body part to weigh as close as possible as the human counterpart. “Many humanoids have been developed, but more complicated and flexible humanoids must be developed in order to realize more natural and various motions like humans,” the scientists at University of Tokyo write. Check out Kenshiro in action below in this video that tests it.